Thunder creates the first in-ear headphones to use the Apple Lightning connection | What Hi-Fi? 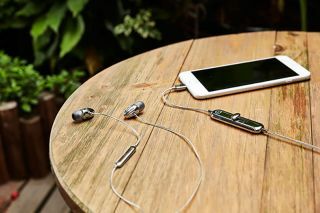 We’ve already seen on-ear and over-ear headphones that use the iPhone’s Lightning connection, but Thunder claims to have developed the world’s first in-ear headphones to provide high-fidelity sound and active noise cancellation through Apple's proprietary connection. The iPhone 7 is expected to be released in September and there's speculation that Apple will remove the 3.5mm headphone jack. One way to get around it would be to use wireless Bluetooth headphones, but some manufacturers, such as Audeze and Philips are turning to the Lightning port for a wired connection instead. Thunder is one such company and has developed a pair of in-ear headphones that will use the port. Thunder claims they are the world’s first Lightning in-ear headphones to provide “high fidelity sound quality, active noise cancellation, battery-free charging and revolutionary sound customisation”. The Thunder in-ears need to be used with the companion app, which adjusts the sound settings to best suit your ears by playing a series of notes at different frequencies and volumes and asking you what you can and can’t hear. They also benefit from active noise cancellation and draw power from the iPhone’s Lightning port. There are two different modes: quiet mode to “completely” block out external sound and aware mode allows some ambient noise in. The in-ears claim to only use one percent of battery per hour. Thunder is currently seeking funding on Indiegogo where it has already surpassed its $10,000 goal with a month to go. You can pre-order a pair from $139 in a chrome silver or chrome black finish.